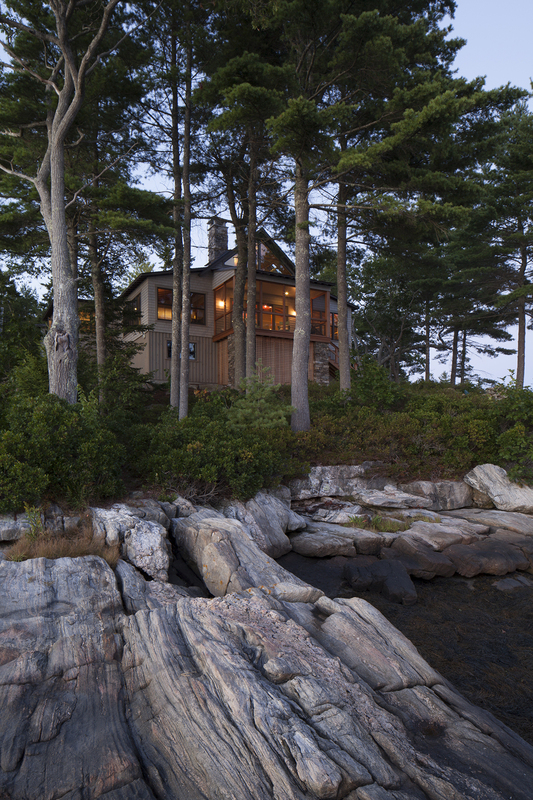 Down a narrow path, beyond a swing hanging from an oak among ledge outcroppings, the original cottage sat under the trees on a point of land. 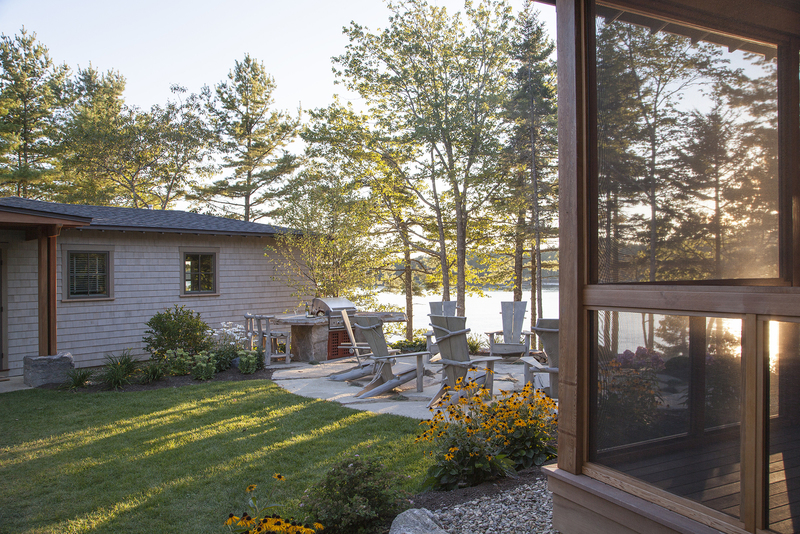 While the owners dreamed of much-needed added space for extended family and guests, the 75-foot shoreland setback confined the possibilities for expansion. 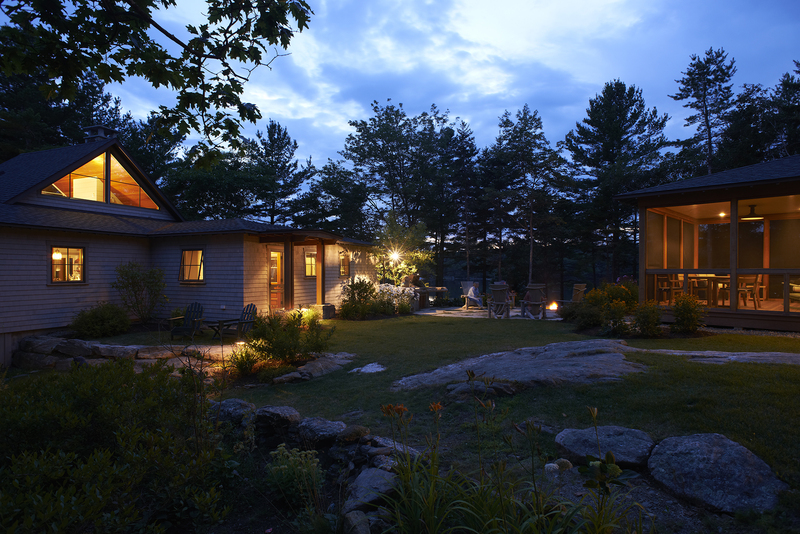 Knickerbocker Group’s solution involved two modestly sized homes: a family cottage and a bunkhouse just beyond the setback, to be built in series to minimize the impact on the land. 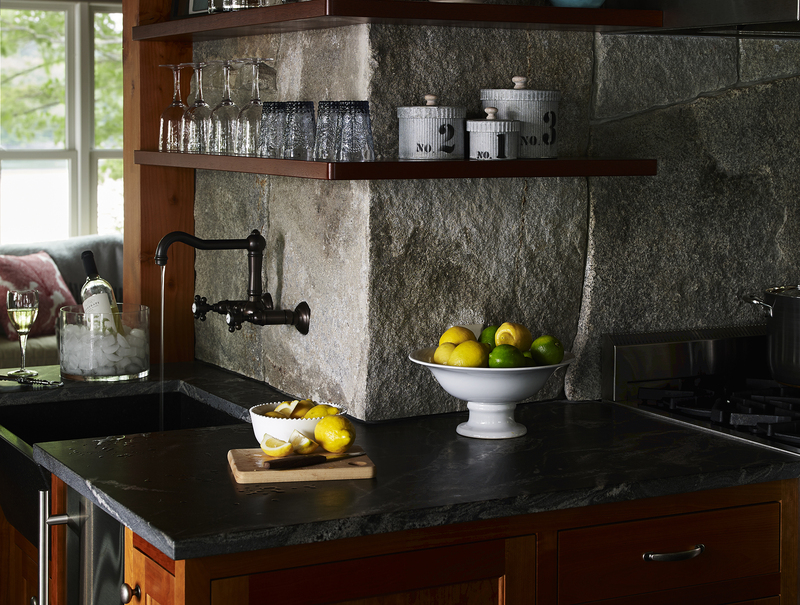 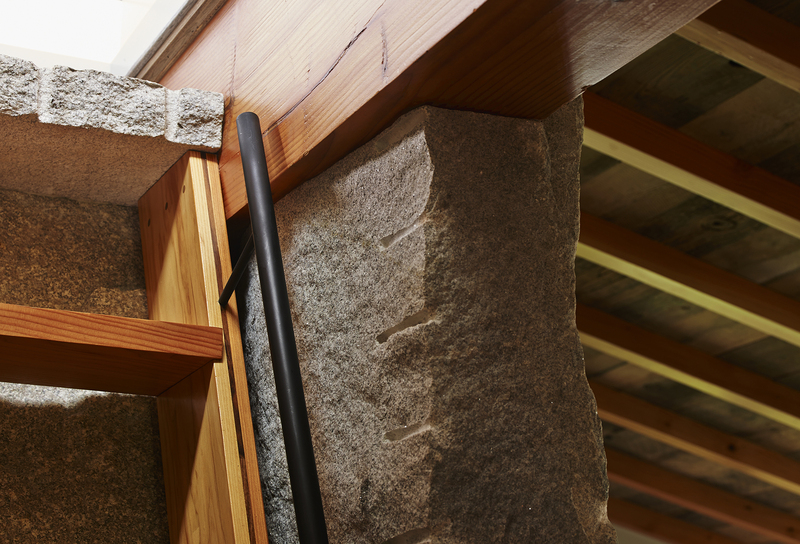 The open plan in the family cottage was designed around a massive stone element in its center… large slabs of rough-cut granite backdrop the kitchen workspaces, a sweeping stone arch graces the fireplace with its over-sized drilled-and-split hearth, the loft ladder conforms to the shape of the stone. 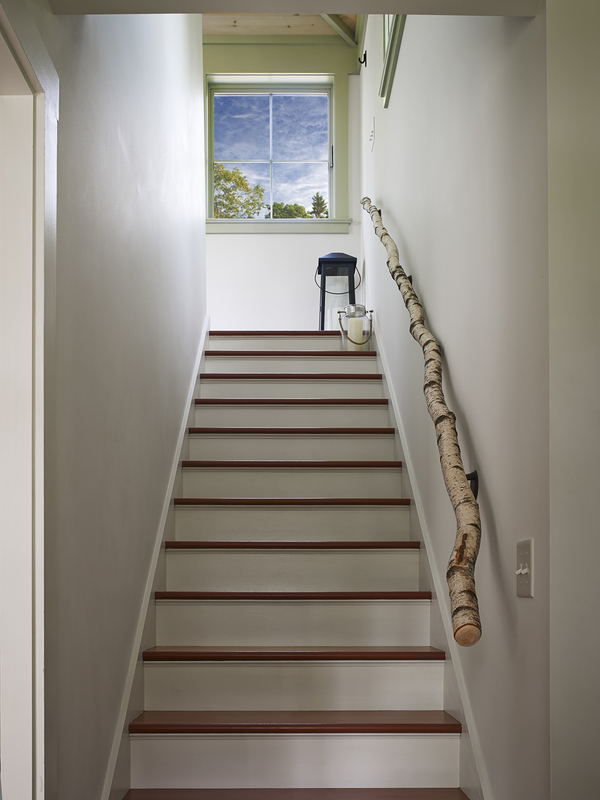 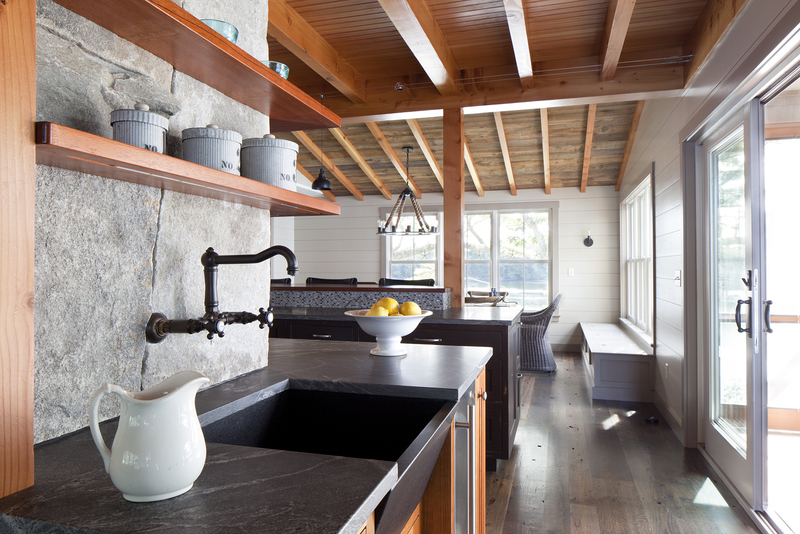 Douglas fir beams, reclaimed ceiling boards, antique oak floors: wood meets stone in clean contoured lines. 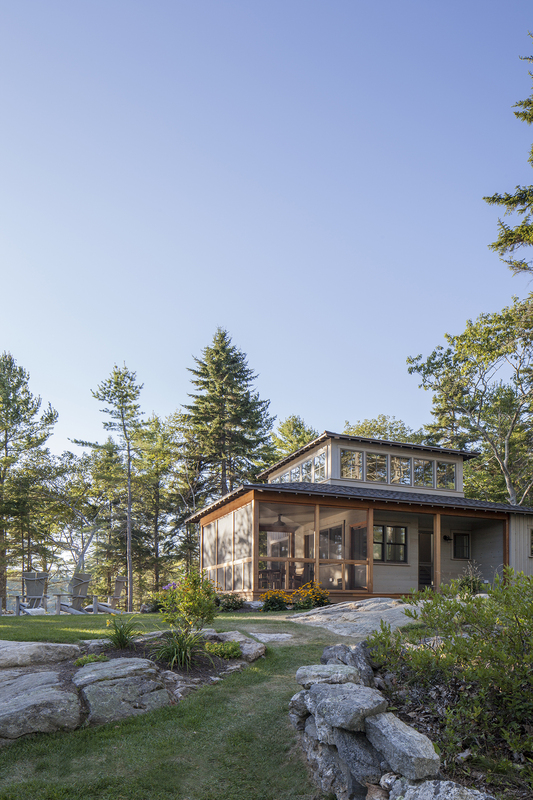 In the tree house style loft with gabled walls made entirely of glass, the materials are echoed in long views of woods, rocks and water. 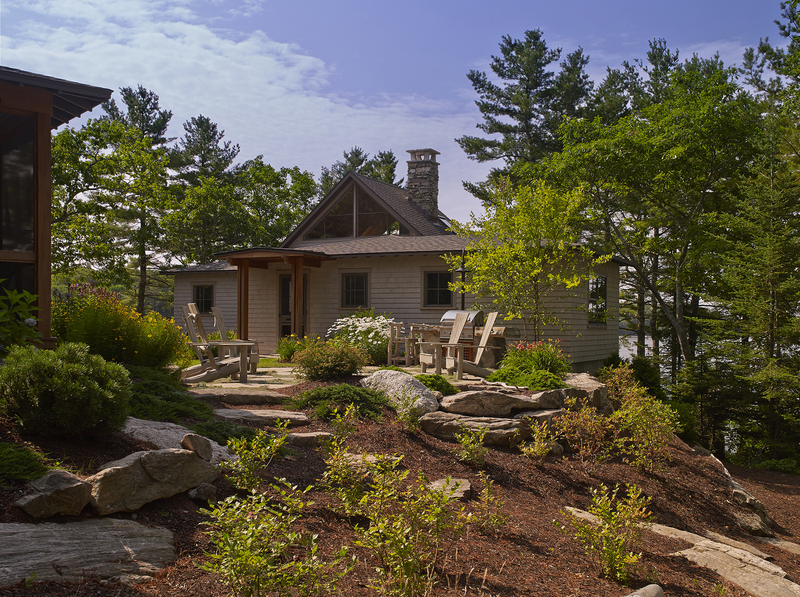 The homes are unified by a central stone patio and fire pit area, characterized by the handmade “found wood” Adirondack chairs and a grill/cooking station crafted of granite. 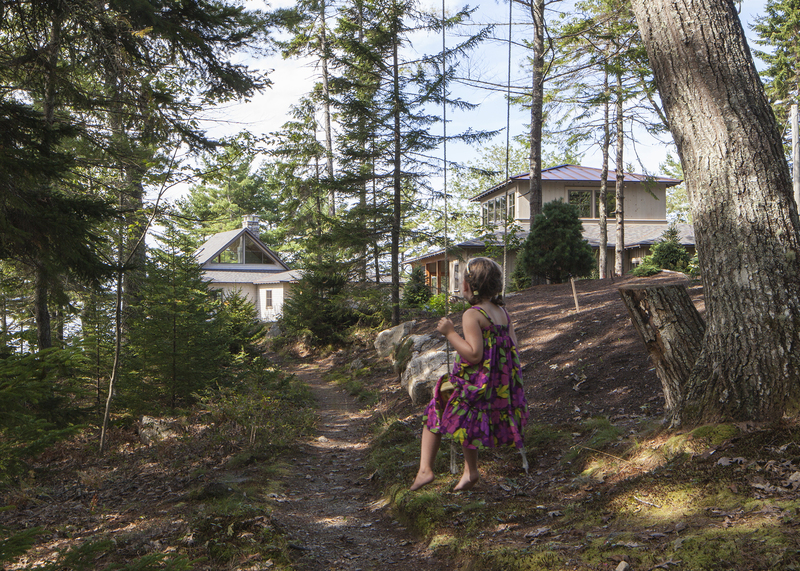 Today, the same narrow woodland path leads you to the new cottages. 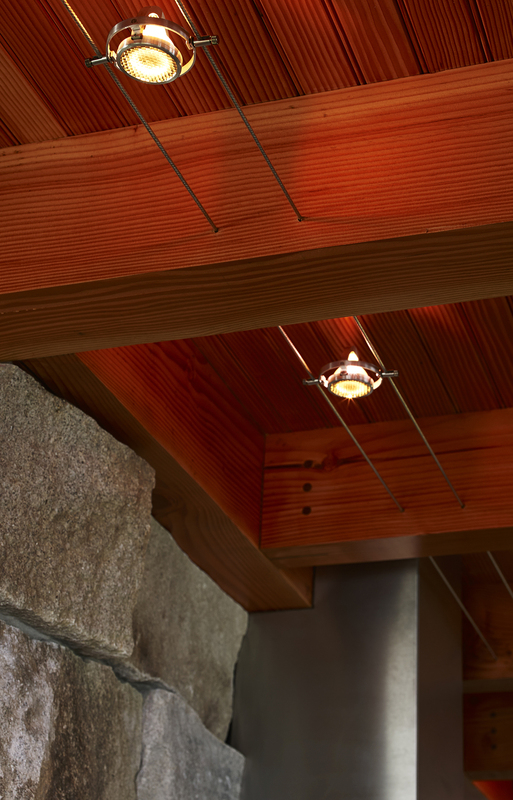 Tucked among the trees, they subtly echo the natural materials in the environment around them. 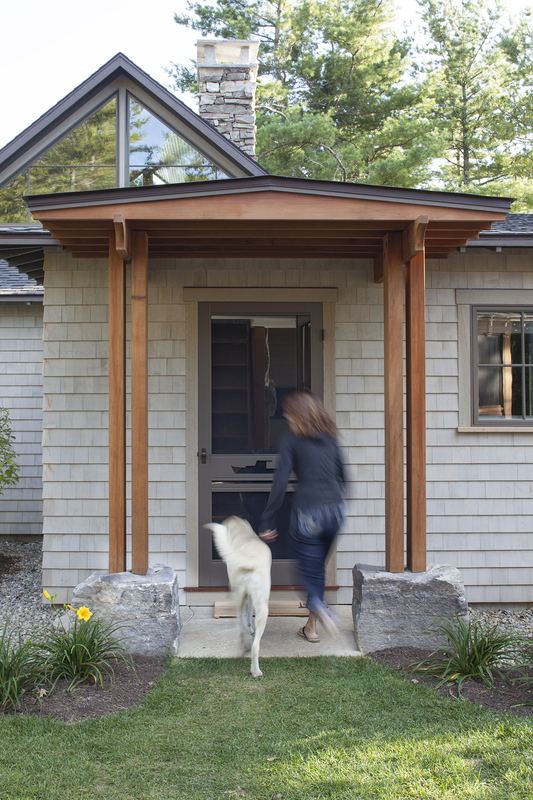 Both inside and out, the union of wood and stone evokes a re-connection to place, a reminder of the elemental nature of Maine. 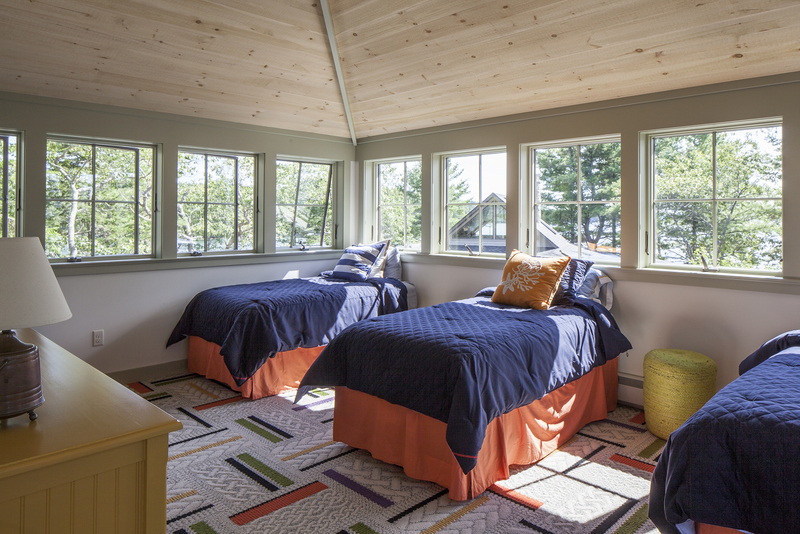 The bunkhouse is eclectic: a modern day bungalow designed to flexibly house teenagers and their friends, or a full troop of relatives. 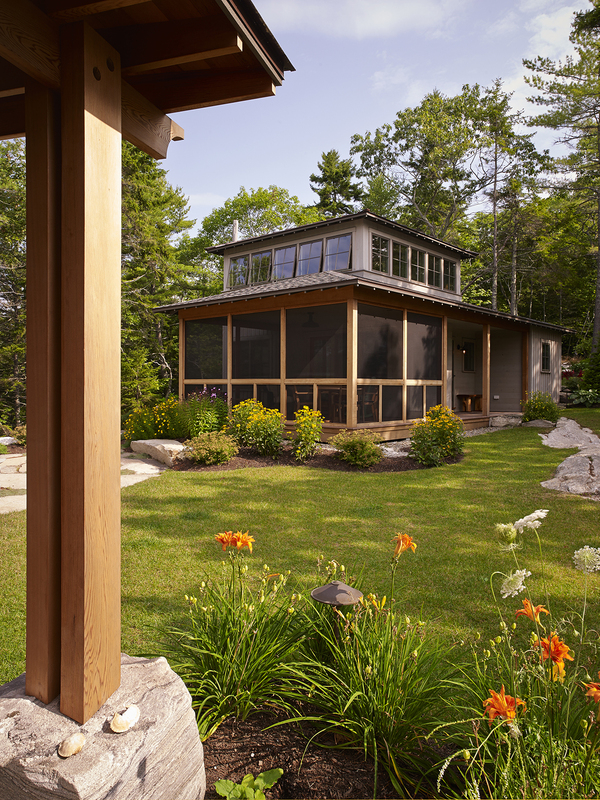 It sits on a slight rise behind the main cottage. 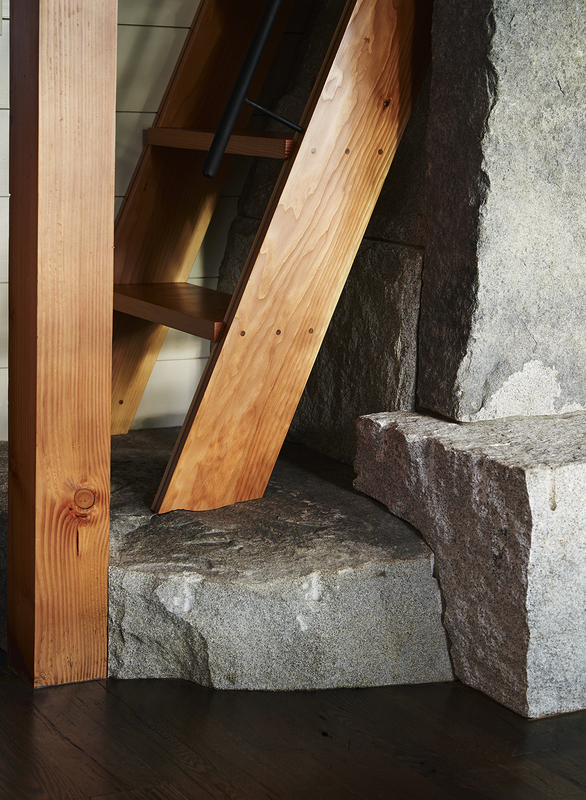 In between the two, custom adirondack chairs by Whitten Hill Studio circle a fit pit built within the stone terrace. 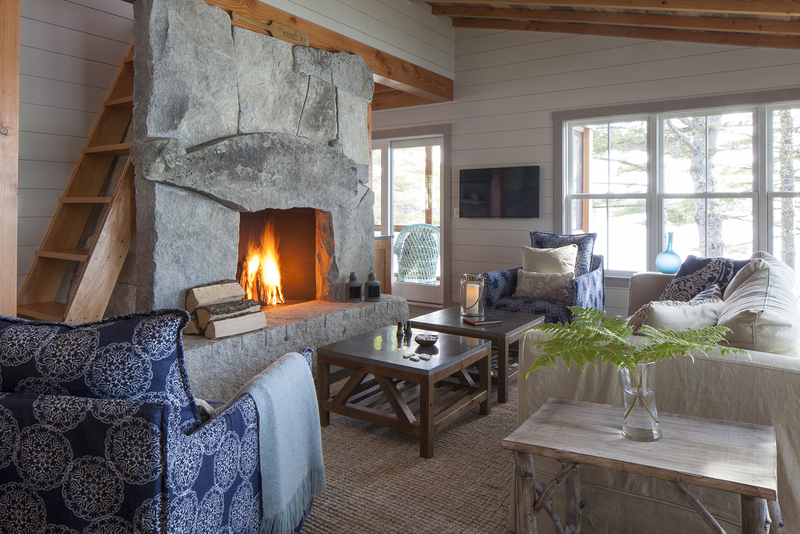 A simple open floor plan encourages gathering, lounging and game playing. 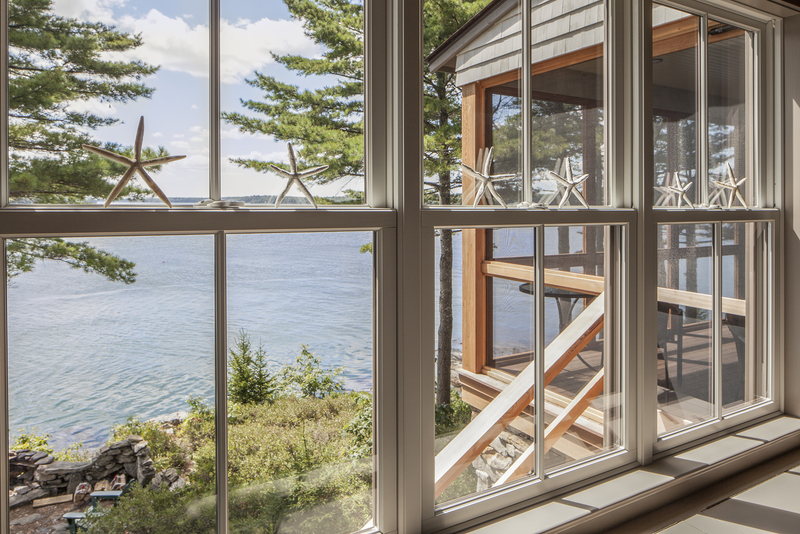 The common room opens to a large screened-in porch that takes in water views on three sides. 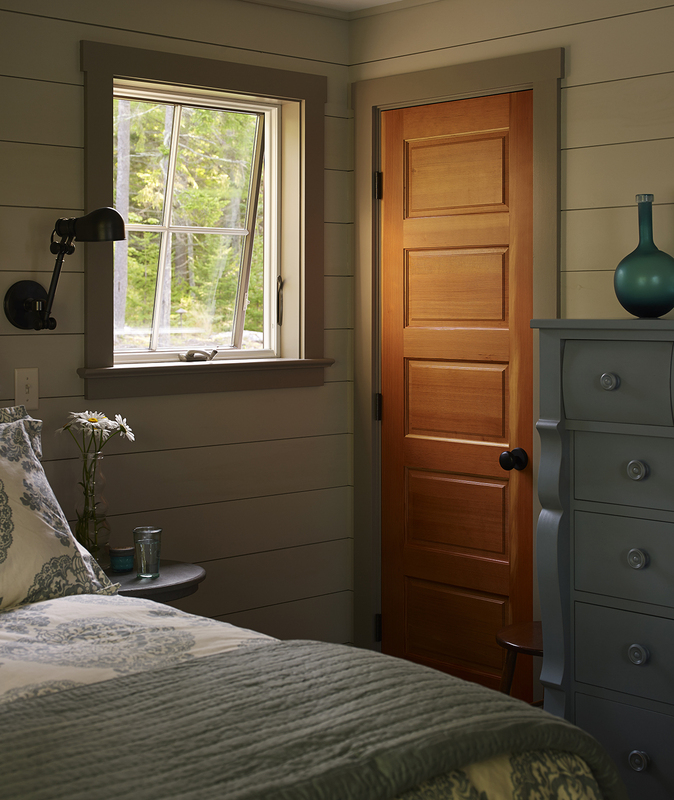 The bunkroom is light and airy with colorful tiled carpet and salvaged leaded glass window art. 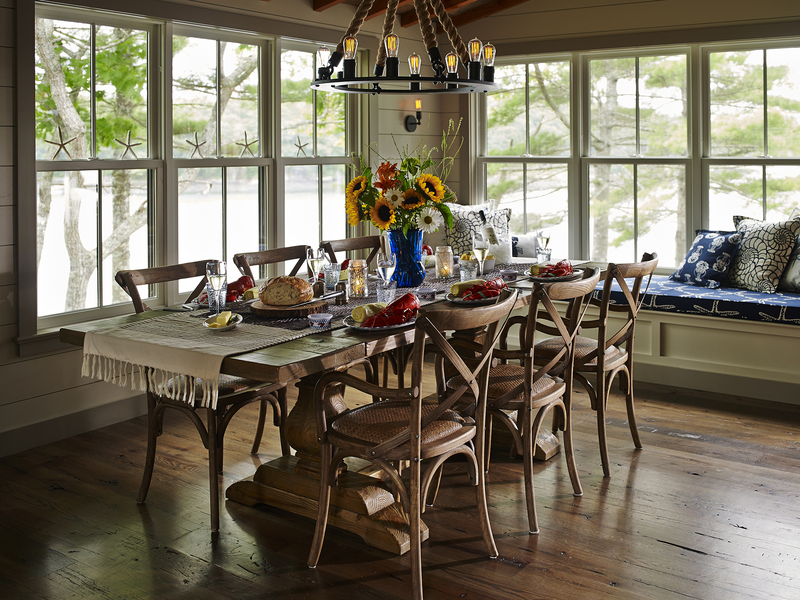 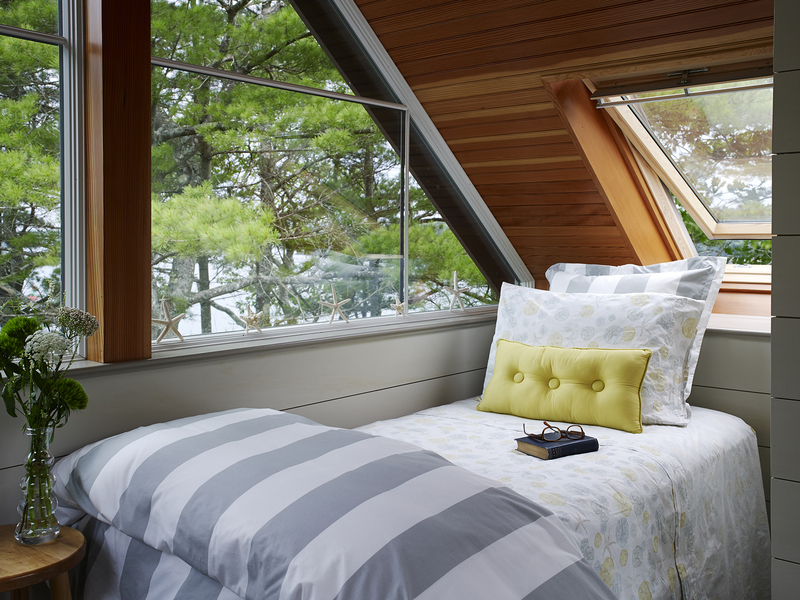 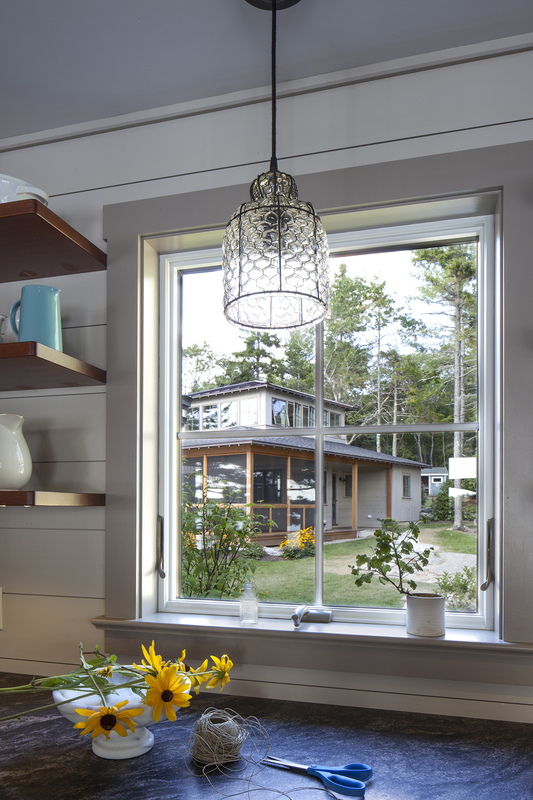 The painted trim and knotty pine ceilings contribute to the casual feel of the space. 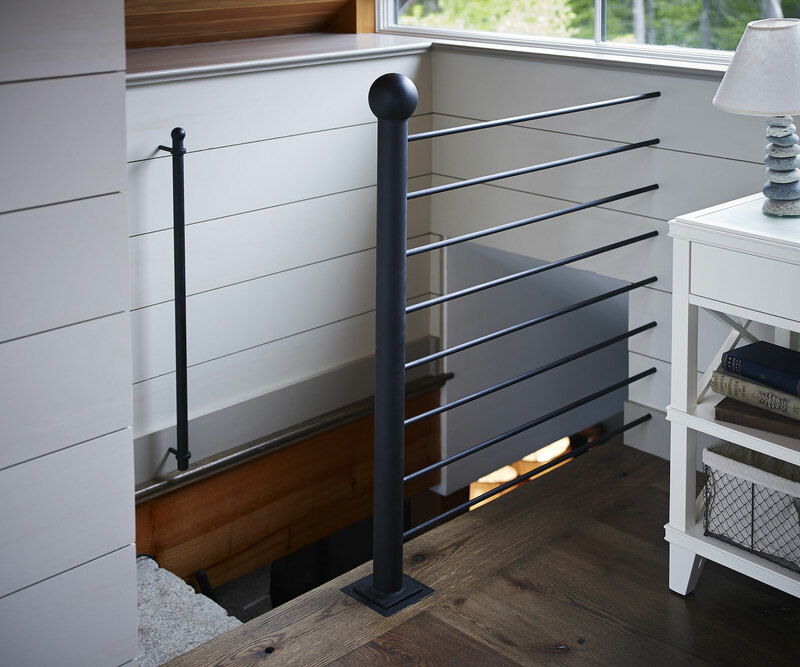 As with all small houses, storage is key! 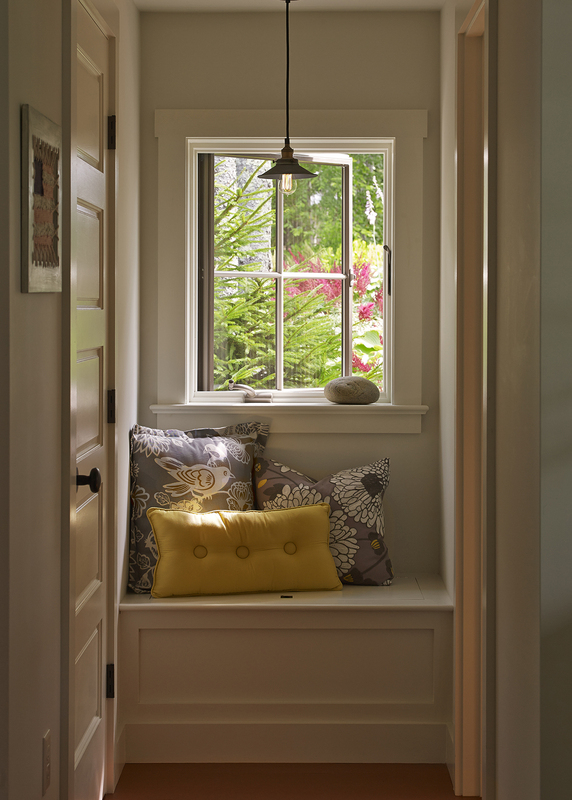 A window seat at the end of the hall, and another at the base of the stairs, keeps extra blankets tucked out of sight.